Kirri Ku Kennels is located in Redland Bay, Queensland. We are all passionate about our pets. Over the years we have had three cats, four dogs, many types of birds and of course fish. 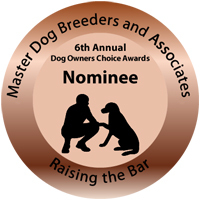 Our interest in breeding dogs has been with us for a long time. 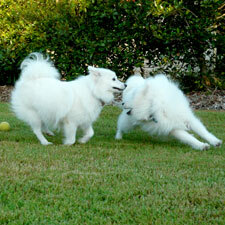 And it has finally come to fruition with our beloved Japanese Spitz Kuro and Kirri. Kuro was born on 8th February 2009; he joined our family on the 4th May 2009. He has a wonderful, calm nature; he settled in very easily into our home, he even made friends with our 19 year old cat Redmond with ease. Kuro was easy to train and mastered the dog door within an hour of training with a few training teats. 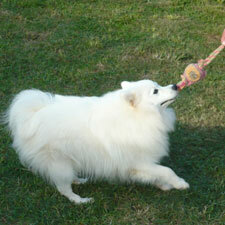 He is a very strong male, with a wonderfully thick coat, and traditional Japanese Spitz features. As soon as we met Kuro, we knew he would make a wonderful male to breed with. 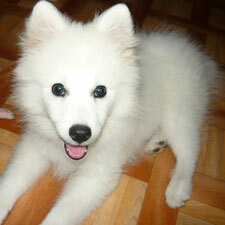 We believed his strong features, loving and loyal nature where definitely our choice for a stud male. Along with his blood line, we were confident that he would help produce the best Japanese Spitz, with all the true Japanese Spitz characteristics that were required. We immediately started to look for a female that would match Kuro. Kirri was born on the 21st September 2009; she joined our family on 18th December 2009. She had a more energetic nature: she took a little longer to settle in. 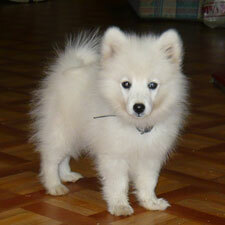 But I have found in our life that female puppies do take a little longer to settle down and become house trained. She and Kuro started to get on very quickly, and Kuro was busy teaching her how to use the dog door and always encouraged her to go out to the toilet when he went out. She is a beautifully natured dog, and is very inquisitive. She loves to keep on the go, and enjoys chasing Kuro around the back yard, and playing ball. 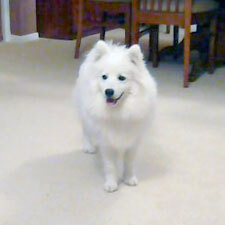 She very much has the fine female lines of a Japanese Spitz, and is more petite than Kuro, as she should be. With her structure, she was a perfect match for Kuro. And we believed they would produce well balanced litters of puppies, which would develop the best nature for our clients, and the puppies would adjust well to their new home environment. Chouko was born on the 30th March 2011. And joined our family on 3rd May 2012. She has settled in well with all our family. She has the typical Swedish coat like Kuro, and the typical fine female facial features. Chouko made herself at home straight away, she loves her food so the food bowl was her first stop. 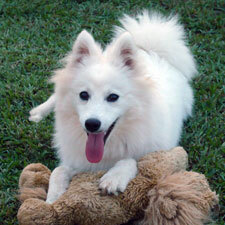 She is easy to train and listened to and obeys commands really well. She loves to please anyone who meets her.